Gamer's Mind: Age of Steam! Tonight was the night. 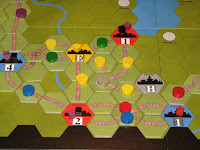 A lost, found, borrowed, and transported copy of Age of Steam arrived amidst our game night. We had 7, and were eager to split into 2 groups: those who wanted to play AoS, and those other losers (I forget their names). I've played Railroad Tycoon once. I heard that AoS is a heavier and less forgiving version of RRT. I expected very bad things if I made the slightest mistake. I expected at least 1 of 4 new players to go bankrupt before the end. In reality, AoS is more elegant. The only nasty thing about it is that you can only issue shares at the beginning of each turn. This forces you to plan...and plan...and plan. You may want to build a certain link. What if someone builds it before you? Where will you build next? How much will it cost? What if you have to bid more than you expect? From what I could see, there are two extremes. Either you decide to hold yourself to a fixed amount of cash and deal with shortages by building less or in a different location, or you plan for the worst case so you can do something good no matter what happens. I didn't plan everything, and I didn't examine contingencies too much. I always made sure I'd have enough cash to build the minimum of what I wanted (and expenses after income), plus a little slop. This worked well for me, although I did not win. I wouldn't call the game forgiving, but there seems to be plenty of room for many different styles of play. I did not miss the cards found in RRT, but I did miss the 3 rounds of building track. I liked that I could focus almost exclusively on building and shipping. As the game reached the midpoint, the number of possibilities became large. Each turn began with several minutes of silent calculation. The one part of the game that is opaque to me is turn order. If I'm not going first, how can I have any control over what action I select? If I allow myself go 2nd, I might not get what I need. Do I take a chance? Should I be able to figure out what the player who might go first will select? Maybe that will come with experience. The board is a minimalists dream: bold, solid colors, very little artistic license that confounds playability, and simple discs and cubes (ie no silly plastic trains or empty city markers). The only negatives are the horrible rules (we were eventually able to figure out what they meant by inference and common sense) and the cheap plastic coins. I like AoS slightly more than RRT after this one play. I might actually try to pick up a copy some day. The turn order thing will come with experience; you can generally tell who wants what and whether it's wise for you to go for first in the order or not. The auction is key, and having first choice is very valuable. You will always get what you want (and probably what your nearest competitor wants, too). The general consensus is that locomotive is the most powerful action, allowing greater increase in income without cost in income; but I have seen it cost people the game if taken too often too early. We're all pretty experienced now, and one of the more frugal players is tending to win more often than she used to. But it's more about efficient spending than not spending at all; if you hang back on issuing shares too much you'll end up trailing with the player who issued too many.